GDP or Gross Domestic Product (GDP) of a country can be defined as the sum total of all the final goods and services produced in an accounting year within the geographical boundaries of that country. GDP is the most commonly and widely accepted measure of economic growth and development by the countries. 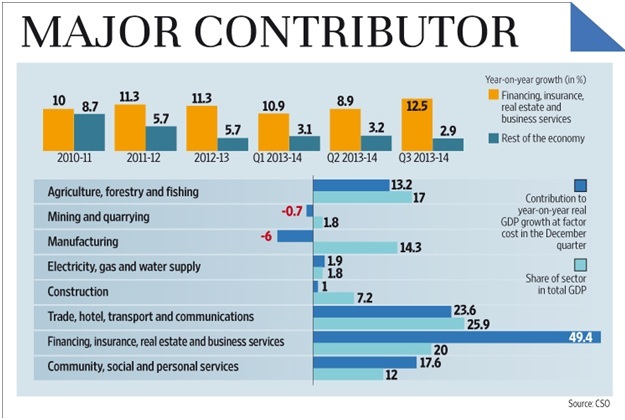 Probably the most importance reason behind the popularity of GDP among the economists as a measure of country’s development is the fact that it is relatively easy to get national income data of a country than the other parameters of growth like basic minimum needs, health, happiness, welfare etc. India is a peculiar case where one can spot the difference between GDP and per capita income as a measure of economic development. 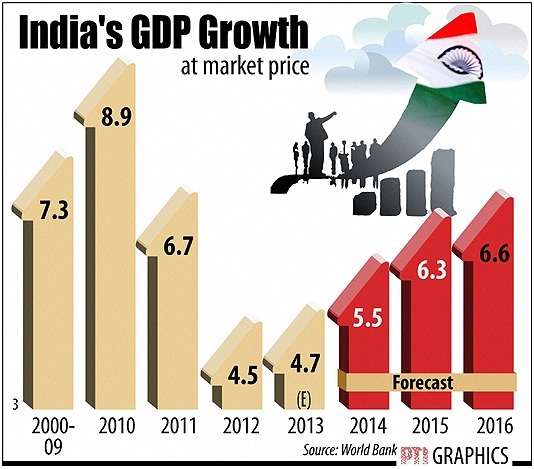 If GDP is considered as the sole criteria of development, India would be the third most developed nation of the world as India ranks third in GDP on the basis of purchasing power parity (PPP). But, if per capita income is used as the criteria for development, there would be a reverse picture. As per the World Bank estimates, India per capita on the basis of PPP in the year 2014 was USD 7277thus if population is not taken into account and development is based on just the criteria of GDP, we would never be able to get the true picture of development. Increasing inequalities of income are the major reason for social unrest in a country. A country ranking high in terms of GDP or GDP per capita may have widespread income inequalities as both GDP and GDP per capita provides aggregate and average income but remain silent about the pattern of distribution of national income among the population. If the richest 10 percent of a rich country are cornering the 80 percent of national income, GDP and GDP per capita income will present a rosy picture ignoring the widespread inequalities and vast amount of population living in abject poverty. Inequalities in an economy can be measured by Gini Index. A Gini index of 0 represents perfect equality, while an index of 100 implies perfect inequality. In 2005, India’s Gini Index was 33.38 and it was better placed that countries like Switzerland and the United Kingdom which had the Gini Index of 33.68 and 35.97 respectively. Meanwhile, it should also be kept in mind that if in a hypothetical country everyone is poor, then on the scale of equality, that country will rank higher but development would be nil in this country as everyone is poor. Probably for that matter, Winston Churchill has one said, “The inherent vice of capitalism is the unequal sharing of blessings; the inherent virtue of socialism is the equal sharing of miseries”. The basic minimum need approach of development become popular in 1970s and many countries adopted it as a measure of development and moved ahead of the countries relying on accelerating GDP only for development purposes. The International Labour Organization (ILO) in its report in 1976 defined basic needs in terms of food, clothing, housing, education, and public transportation. This approach worked at two levels simultaneously i.e. accelerating economic growth and insuring income distribution. After the disillusion of economists with the GDP approach of development, many approaches were put forth as a parameter for the development of a country, but in the course of time, it was realised that GDP may not be the wholesome measure of development but any approach which excludes income would also fail to provide a complete picture of development. Moreover, it was also realised that the economic growth and development itself is not an end but a means to an end and that end is human development for which everyone should aspire. Therefore, MahbubUlHaq and AmartyaSen developed Human Developed Index (HDI) to measure the level of development in a country. The HDI is a composite index which includes life expectancy and birth (measure for healthy population), gross enrolment ratio (measure of literacy) and GDP per capita on the basis of PPP (measure for income of country). HDI is published by United Nations Development Programme (UNDP) and is generally accepted by the nations across the planet as a measure of development. However, HDI too had its share of criticism for not being able to include various other concepts of welfare like gender issues, inequality, sanitation etc. A quality human life depends on many things and making an index which includes every factor affecting the human life is not humanly possible. Moreover, every approach for development is important in one or other aspect and none can present a complete picture of development. But one thing generally agreed among the economists is that any measure which excludes the GDP would be far from presenting a true index. The upshot of entire argument is that increase in GDP is the most important factor to ensure development but not the only factor for that matter.